My first real Street Portrait since I started this project, taken in the first ‘hunt’ of the project. Also my first Street Portrait since at least 8 years, or so. 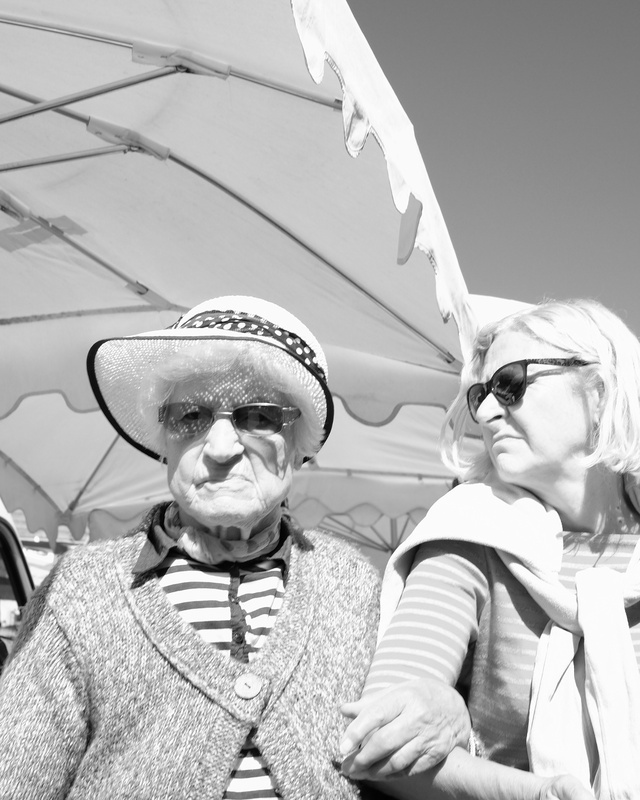 Roaming a market in Autrans, France, with my family, I was looking for pictures for the family archive, and also for my project, obviously. In my bag are a couple of primes. The 18, 35 and the 60mm. For this project I think the 35mm will do best, but I’m constantly hesitating: should I go for the 18, or 35mm? I just love the focal length of the 35, so that’s what I put on by default. “Why didn’t I buy the zoom lenses”. A question I ask myself often, when I go out for a shoot. But then, after the decision has been made, I’m very happy with the quality of the primes, and the aperture possibilities. I love shooting wide open. 1.4 on the 35mm that is. Amazing. Beautiful. Not today. Way too much sunlight. Perhaps I do need to buy that variable ND filter (yep, I suffer the Gear Acquisition Syndrome). Also, I wanted more dept of field. This candid shooting had to be done quick. And the narrow streets of the market and it’s crowd didn’t allow for easy composing. So better shoot at f8, I decided. Never before have I used the fujifilm film simulations. I’ve always used RAW. For this project I decided I wanted to try to use the Monochrome+R filter, next to my RAW. The photo above is Straight out of Camera (SooC). I actually used the Android app of Fuji to download the photo to my phone, and I’m writing this post on my phone. I love being mobile! Actually I’m quite pleased with this image for both the content and the processing that is. On my phone (I’m currently on holiday and haven’t got my laptop with Lightroom with me) the Monochrome conversion looks quite nice. I probably want to process the file in Lightroom to give it more contrast (yes, even more), but for now this is cool. Pick a focal length and stick with it, or at least stop thinking that another lens might be better. The more I practice, the easier this will be, probably. I could try to make use of zone focusing. This will definitely speed up the making of the shot. This time I had to aim, focus and release. It takes time. Zone focusing is faster. But then again, I love shallow depth of field. It’s hard to do zone focusing at 1.4. But this time it was at f8, so I could have used zone focusing. Strap, or strapless? Another love hate relationship. Actually, I hate camera straps. So I never have straps. Never had them in the past either. But it’s a pain if you don’t have them, because there is always a scenario close by, where you need two hands for something else… So sometimes I attach them and give them a try. And then I keep removing them after a couple of hours. I need to sort this out. Also learned: Indeed, I love doing this!